Brachypelma boehmei Schmidt & Klaas, 1993, also known as “Mexican fireleg” or “Mexican rustleg tarantula”, is a stunning brid spider due to its behavior and coloration from Mexico. Although the Brachypelma-genus is considered to be rather docile, Brachypelma boehmei is rather nervous. She won’t hesitate to shed her urticating setae in your direction. Don’t confuse the spider with Brachypema emilia or with her smaller look-a-like from another genus, Aphonopelma bicoloratum. Mature males of Brachypelma boehmei are quiet similar to their females, where an Aphonopelma bicoloratum mature male is black. Also known as: Mexican fireleg, Mexican rustleg. Urticating setae: Yes, type III (abdomen). Behavior: Nervous. The spider will try to flee at first. Persistent provocation can, and probably will result in use of urticating setae. In order to detect their prey easily, they’ll create an almost invisible and tangled web on the surface at the entrance of their burrow. The Brachypelma-genus possesses beautiful colors, not hiding them at all. They’re out most of the time, waiting for unexpecting prey to pass. Life expectancy: Females become up to 20-25 years old. Males are given a shorter lifetime of 7-8 years. Exceptions get 9-10 years old, which is very old for a male tarantula. Nevertheless most males die within 2 years after making their spermweb. Temperature: 25-28°C (day), 21-25°C (night). Humidity: 55-65%. During 4 consecutive months a year this may rise to 65-75%. Adult: LxWxH: 40x30x30. Min. 3-4x span width in surface. Smaller than adult: Min. 3x span width in surface. You’ll see the spider crawling around plenty of times, even on the glass. * Make sure there’s nothing sharp in the terrarium. Smaller than adult: 1,5-3x body length. Wet season: June, July, August, September. Dry season: January, February, March, April, November, December. Warmest month: April. In general, temperatures are rather high. • West-Mexico, along the Pacific Coast, and Sierra-Madre. • Natural and captive bred hybrids are known. Inform yourself in order to make sure you’re breeding the same species. • Thoroughbred species can be hard to find in the hobby. Besides the true Brachypelma vagans, for example, you’ll often see them show up as “Brachypelma vagans hobby form”, being a hybrid of a female Brachypelma vagans and another male from the Brachypelma-genus (probably Brachypelma schroederi or Brachypelma albopilosum). Please leave the breeding to the professionals. Caution: Because of the fact species from the Brachypelma-genus can be very similar, it’s hard to distinguish one from another. However people breed species with good intentions, different species have been mated plenty of times being convinced of the fact they were the same. Thoroughbred species from the Brachypelma-genus are available in the hobby, but make sure your source is valuable. With a little experience, breeding a Brachypelma boehmei is not that difficult. The females are exacting, as you’ll need to simulate both winter (6-8 weeks (no food)) and spring (3-4 months (lots of food)). Let the terrarium dry out, but keep substrate slightly moist, because the female doesn’t like a humid environment close to her posterity. • Plan mating in autumn. • Simulate a winter from 6-8 weeks (10-15°C), 2 months after mating. Don’t feed or bother the spiders during this period. • Systematically increase temperatures (25-29°C) and moisten substrate (70-75%) once after winter. Make sure there are no puddles inside the terrarium. Keep temperatures perfect, as you triggered the female to start making her cocoon 60-90 days after mating. • From the moment the female is visible at the entrance of her burrow, you might expect 300-1000 spiderlings to come out 8-10 weeks later. Deprive the cocoon, when desired, 7 weeks after you’ve seen her protecting the cocoon. Store the eggs at a humidity of 65-70% and a temperature of 26-29°C. • Megaphobema mesomelas was part of the Brachypelma-genus until 1991? She was removed to the Megaphobema-genus due to its shorter hairs and longer carapace. • Contrary to other species of the Brachypelma-genus, Brachypelma albopilosum, Brachypelma angustum and Brachypelma vagans live in tropical humid area?  • Very beautiful webpage about B. boehmei, made by E. Hijmensen. 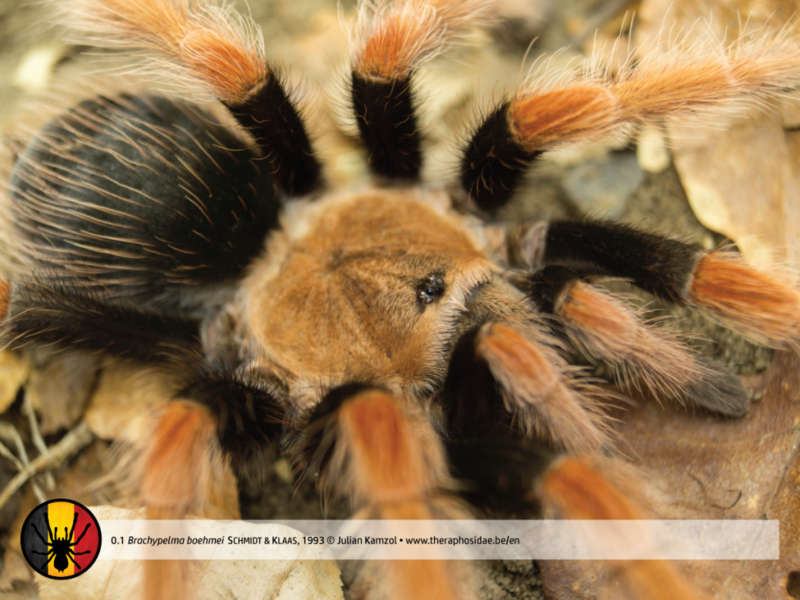 • Distribution and natural history of Mexican species of Brachypelma and Brachypelmides (Theraphosidae, Theraphosinae) with morphological evidence for their synonymy.